Security Memetics: When Clocks Are Outlawed Who Will Serve Time? The Internet is abuzz with the story of the 14 year old boy who was arrested, cuffed, and interrogated (apparently without a legal guardian present?) because some idiots in authority felt scared by a clock that he made and only ever referred to as a clock. 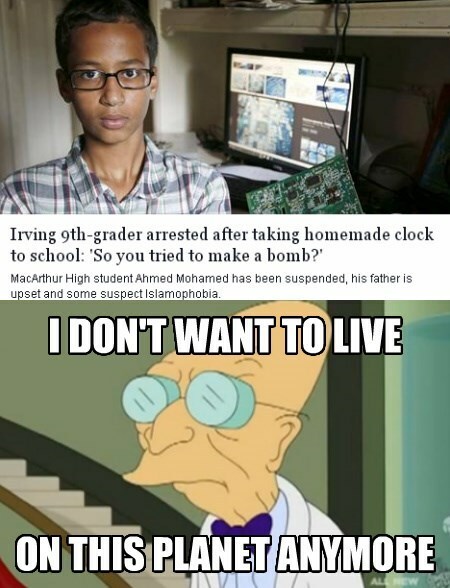 Check the #IstandwithAhmed hashtag on twitter for more opinions and details. Repeat after me, people: If it only ever gets called "a clock" and tells time like a clock, then it's a clock - and making clocks is not a crime. by kurt wismer in cartoons, i don't want to live on this planet anymore, WTF?